This recipe came about a little differently than our usual Cooking to the Wine recipes. Normally, I open a bottle early in the day. I taste it–usually Greg joins in as well. Then we take notes and brainstorm about what would make a good pairing. This one developed more gradually. I work part time at a wine store in Oakland and given that it’s summer, we’ve been selling a whole lot of rosé. 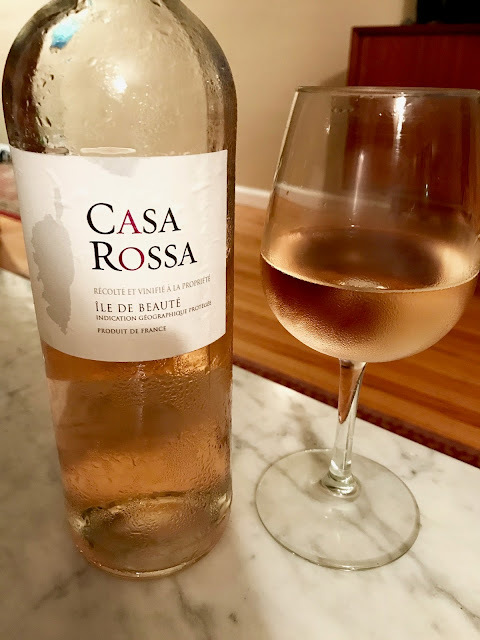 We have a lot of beautiful versions, but the Domaine Casa Rossa Rosé caught my attention for it’s value–WineSearcher.com has the average price at $14, and we sell it for $12. I think it shows a lot of complexity for the low price tag. The wine is bright, crisp, and pretty–everything you’d want from a rosé. It shows notes crushed berries, a hint of white peach, and light herbs. It was a lot in common with the classic rosés of Provence (like the VieVité I mentioned here), but then there is a layer of saline minerality like a sea breeze wafting through wine. This wine is from the IGP L’Ile de Beaute on the island of Corsica, in the Mediterranean sea between the coasts of Provence and Tuscany. The wine really takes you right there with that sea breeze. After trying this wine a few times, an idea for this dish began to take shape. I love the excellent tinned sardines you can find out of the countries around the Mediterranean. (They put a totally different spin on canned fish–it tends to be so much better.) I thought this would be the perfect thing to drink with those sardines. The rest of the dish grew up around that craving. Then the beautiful zucchini available during the summer months caught my eye and I decided it would be an interesting combo with the sardines. As it turns out, zucchini is grown on Corsica and is a big player in the cuisine. Beyond that, I liked the idea of creating a dish that was easy, inexpensive, and an over-achieved in a similar way to the wine. The rest of the ingredients are really simple, but altogether the dish looked and tasted way more extravagant than it was. Greg was admittedly skeptical at the combo of zucchini and sardines when I told him the idea, but he ended up loving it. We cozied up with two big bowls of this and there were no leftovers. My experience with Corsican wines is somewhat limited, but have really liked a lot of what I’ve tried. Moreover, every time I’ve come back to them over the years, they seem to keep getting better and better. This is apparently no accident, as there has been greater emphasis on quality in recent years. As I mentioned earlier, Corsica lies between France and Italy. It’s actually closer to Italy and draws quite a bit of historical and viticultural influence from that county–you’ll see quite a few Italian grapes here for example. However, it’s been under French rule since 1769. This was Napoleon's birthplace–he was born in Ajaccio, the capital–and apparently the island is still entitled to sell duty-free wines and tobacco under Napoleonic law. The quality of Corsican wines has benefited from a couple of major event in more recent history. When France lost control of Algeria in the 1960’s, quite a few skilled growers migrated to the island and quadrupled the amount of land under vine by 1976. The only problem was they planted vines that favored productivity over quality, so most the wine produced was bulk wine. In the 1980’s EU subsidies began to favor uprooting these kinds of vines, so as to reduce the so-called “wine lake” (there was a lot of cheap bulk wine around) from growing. Since then Corsican vineyards have been restructured quite a bit to put a greater emphasis on quality. Most of the wines exported out of Corsica nowadays are under IGP L’Ile de Beaute (Island of Beauty–such a charming name, makes me want to go), but this is changing as producers have started to focus more on the varied terroirs, of which there are many. It’s a mountainous island with a lot of different climate and soil variations. As an island, of course there is a lot maritime influence, however, it’s also drier and sunnier than just about anywhere in France and the summer sun really concentrates the flavors in the grapes. Like I said, the price tag on this is just over $10 making it really good candidate to keep around as a House Wine. One of the main factors I was reacting to in creating this pairing was that briny quality in the wine, so I think other wines with ta similar note would also make good pairings. Another Island wine comes to mind here–Assyrtiko from Santorini. Vinho Verde, Albariño, and Txakolina might make great options as well. 2. Bring a large pot of salted water to a boil. Add the penne and cook for about 8-10 minutes, until the pasta is al dente, or follow package instructions. Drain the pasta and set aside. 3. Place the zucchini pieces in a baking dish with a generous amount of olive oil. Sprinkle with salt and pepper. Roast for 15 to 20 minutes, until lightly golden brown, rotating halfway through. 5. Distribute the penne into bowls and add additional Parmesan, pepper, or thyme as garnish if desired. Divide and arrange the sardines on each serving of pasta. Serve. This month I’m participating in a discussion again with the French Winophiles. The topic this time is all about French wines under $20. When I first tasted this wine, I knew it’d be perfect for this discussion. If you're interested in joining all you have to do is tune into the #Winophiles on Twitter tomorrow 8/19 at 11 a.m est/ 8 a.m. pst. It also just happens that this is a category I drink a lot, so I’m hoping to have a few more for you soon. I have also covered quite a few through my 8 & $20’s on WineSpectator.com, since the wines used for that series are always under $20. Here are a few more dishes I’ve created over the years that have been paired with French wine. Looks wonderful, Nicole, and so French (at least in spirit). We get so stuck on the same old fish, I love to see less frequent choices. Love that idea! Could at least join in spirit! Love sardines! And your recipe sounds delicious - gonna have to try this one. Not sure I'll be able to convince my husband to eat sardines (he tried once in Spain and said never again) but that will leave more for me. Great post! Thanks! This would also be an easy one to make for one when he's away and curl up on the couch with the bowl and the movie. I've never had Corsican wine, but yours sounds delicious! I'm a big fan of a bit of salinity in wine! I'm typically not a fan of Sardines, but I'd mostly had the crappy ones. When we visited Spain and had fresh sardines and anchovies...well that was altogether different! Will have to try your recipe! This is great! I've had a lot of fun with Corsican wine this summer after our #Winophiles trip there earlier this year. I love when fresh salinity comes through in these coastal wines - so exquisite. Also, there are so many delightful sardines in the markets. I have an olive oil can in the pantry that I'd love to use in this dish. Off to tell my hubby whats for dinner!